This unique Spa Table has become the top choice table for Spas in the world due to its simplicity and functionally. The clean lines foster a sense of elegant simplicity, while the custom designed cabinetry, complete with four electrical outlets inside the cabinet, adds a functionality that makes incorporating a hot towel cabi a convenient reality. Therefore, it should come as no surprise that Clodagh has designed countless spas with these same ideals in mind, always striving for the perfect blend of form and function, finding a formula that is equal parts purpose and art. 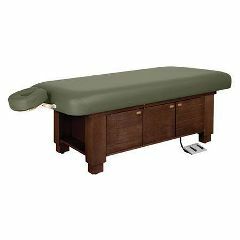 The Flat Top option is all that you need for some massage modalities and is the most affordable top option available from Oakworks. Our selection of padding and upholstery choices all but guarantee that your clients will enjoy every second of their massage experience and it's superior construction ensures lasting quality at an unbeatable price. Length: 73" Padding: Aero Celâ„¢ System 4"